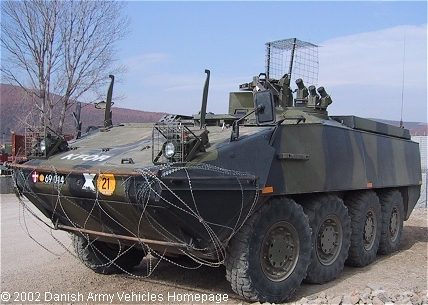 Danish Army Specific: In the spring of 1997, the Danish Army, represented by the Army Technical Service, issued a comprehensive Request for Proposal together with specifications for an armoured personnel carrier. At the same time, the Army Technical Service requested the bidders to put one fully equipped vehicle each at their disposal for a thorough test and evaluation, which then took place in all areas of Denmark during the months of August until October of 1997. December 29, 1997 the Danish Army Materiel Command signed a contract worth 130 mill. DKr concerning deliverance of 22 Piranha III APC´s, build by the Swiss company Mowag, who also supplied the Eagle. The Piranha is operational at the DIB for replacement of the Unimog 416 and the MAN 8.136. Total need of this vehicle is 22 (18 APC, 2 CP and 2 ARV), and deliverance of the first 2 vehicles took place on May 28th.1999. The remaining 20 vehicles have been build by Falck-Schmidt in Odense. The company is well known for it's upgrade-program of the Danish M113 APC´s and the Leopard 1A5 and the midlife-update of the M41. By end of August 2000 12 vehicles have been handed over to the Danish Army Material Command, and the remaining 10 was delivered before end of December. 11 vehicles were deployed to Kosovo in February 2001. A further batch of 22 vehicles were ordered in June 2003. Of these, 11 vehicles will be the APC variant and the remaining 11 will be configured as ambulances. Historical: Development of the Piranha series, which was a private venture, dates back to the early 1970´s with first prototype completed in 1972, and first production vehicles in 1976. Canada placed an order for 350 6 x 6 Piranhas in February 1977. These were build under licence in Canada by Diesel Division of General Motors Canada. Denmark was the third country having evaluated and selected PIRANHA III category vehicles which appeared for the first time in early 1996. The Piranha III features improved mobility and armour protection compared to the earlier Piranha II. Piranha III models also have higher payloads and gross vehicle weights that enables them to undertake an increased range of battlefield missions. - the US Detroit Diesel 6V53TA, developing 350 HP at 2800 rpm coupled to an Allison MD3560P automatic gearbox. The first PIRANHA III 8x8 (called LAV III Kodiak) for the Canadian Forces were fielded in March 2000, and a total of 651 vehicles have been delivered. Sweden has taken delivery of the first two PIRANHA III 10x10. Ireland signed a contract for 40 vehicles (34 APC, 4 command post, 1 maintenance and 1 ambulance) in 1999 which were delivered between June 2001 and early 2002. A follow up contract for 25 APC´s were signed in 2003. The APC´s are fitted with a Thales FVT800-series turret. New Zealand ordered 105 vehicles in year 2000 to replace the M113. Spain ordered 18 vehicles in 3 different configurations (APC, command post and ambulance) for the Spanish Marine Infantry. As a further evolution of the Piranha family of armoured wheeled vehicle, as adopted by various NATO and non-NATO countries, MOWAG developed as a private venture the Piranha IV 8 x 8 vehicle to complement any applications over and above the Piranha III capabilities. The heavier Piranha IV 8 x 8 vehicle, using the proven technology of the Piranha III, offers higher levels of armour as well as mine protection and meets the future EURO 3 traffic emission regulations. It is powered by a MTU 6V 199TE20 developing 544 HP coupled to a ZF Ecomat 7HP 902 gearbox. Typical new features are the digitised vehicle information system (VETRONICS) with built-in test (BIT) capabilities, the reduced radar and thermal signatures, as well as the latest anti-tank mine protection concept. At least 6.500 units (model I to IV) have been produced so far. Among other users of the Piranha family are Australia, Botswana, Ireland, Oman, Qatar, Saudi Arabia, Switzerland and the United States (called Stryker). Also manufactured under license in Chile (Cardoen Industries and FAMAE) and Great Britain (Alvis Vickers). In 2006 the Belgium government agreed to allocate EUR700 million (USD 846.6 million) for the acquisition of 242 Mowag Piranha IIIC 8 x 8 armoured personnel carriers (APCs) and its variants for its Armoured Infantry Vehicle programme. Length: 6.96 m (271 inches). Width: 2.85 m (111 inches). Height: 2.66 m (104 inches). Weight: 18.500 kg (40.700 lb.). Armour: The Piranha protects against fire from 7.62 mm guns down to 100 m.
Engine: V6-cylinder MTU, type 6V183TE22, 10.960 cm3 (665 cubic inches) displacement, turbo-charged, inter-cooler, air cooled. Horsepower: 400 at 2.200 rpm. Transmission: ZF 7HP600 automatic gearbox (7 forward, 1 reverse). without preparation: 1.4 m (54 inches). Fuel capacity: 300 liter (66 gallons). Range: 600 km (375 miles). Crew: 1 (2) and 10 soldiers. Armament: The Piranha will be mounted with a German Krauss-Maffei-Wegmann 1530 turret housing a 12.7 mm (cal. 0.50) machine-gun with day/night-sight (4/6 x) and 6 smoke dischargers. Additional: The vehicle is a 8 x 8 and equipped with run-flat tyres, ABS and CTIS-system (Central Tire Inflation System). The CTIS has 4 pre-selected tire-pressures for road, terrain, sand and emergency. The pressure of each wheel is controlled every 30 seconds. Its prepared for air-condition and mounting of add-on-armour. The body can be lifted up to 23 cm through a hydropneumatic suspension system when driving through mud etc. It's air-portable in e.g. C-130 Hercules. Top-speed is 105 km/h. Mounted with Eberspächer D9W heater and Behr air condition.